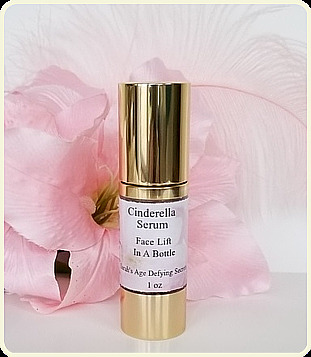 Cinderella Instant Skin Tight Serum is the most concentrated, effective anti wrinkle serum that tightens the skin "immediately" as well as provides positive long term effects by strengthening the connective tissue of the skin. Helps promote the formation of collagen-1. Super-effective L-Arginine, the All-Star Amino acid for skin, penetrates the skin by stimulating blood flow, increasing circulation, and naturally binding to water. 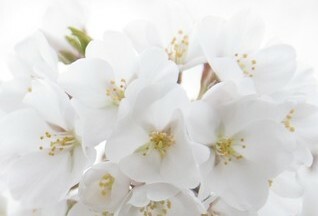 Not only does this help to increase the efficacy of other ingredients, but it also deeply hydrates the skin. L-Arginine is also involved in the collagen synthesis process to help restore the look and feel of healthier, younger-looking skin. It also activates the production of protein, and because of this action helps prevent tissue deterioration. Super-effective serum Argireline and Pepha-tight tighten skin around the face eliminating wrinkles, fine lines, double chin and sagging. Fast, instant skin firming and tightening gives you smooth, wrinkle-free skin fast and effectively. Sodium Hyaluronate provides superior hydration to improve your skin's elasticity and healthy collagen production, while Cucumber Extract and vegetable-derived glycerin provide cell membrane repair and protection. Cucumber Extract is a skin care ingredient that helps nourish, hydrate and smooth skin as it consists of high quantities of vitamin C and amino acids. 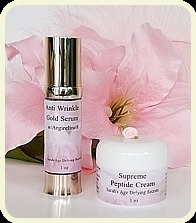 This Extraordinary Wrinkle Serum is formulated with Sodium Hyaluronate. Sodium hyaluronate has become popular with the cosmetic industry and anti-aging skin care products for its ability to penetrate skin and hold onto water. Sodium hyaluronate is the salt form of skin-replenishing ingredient hyaluronic acid and is considered more effective for skin. The molecular size is smaller than HA (making it especially penetrative), and is able to hold more water than any other natural substance - up to 1,000 times its weight in water! One of the potent ingredients in this face lift serum is Pepha-Tight. PEPHA®-TIGHT is a unique natural tightening and firming active ingredient. It delivers both a fast instant tightening experience and a superior long term skin long term skin firming effect. It is a highly purified biotechnologically produced extract from the microalgae Nannochloropsis oculata combined with a well balanced fraction of polysaccharides. It has been shown to protect human fibroblasts from oxidative stress, simultaneously increasing the formation of collagen-l thereby promoting a long term tightening effect through the strengthening of the skin's connective tissue. Another promising ingredient in this Skin-Tight serum is L-Arginine, called "a magic anti-aging bullet" a non-essential amino acid that promotes the production of collagen. Nitric Oxide is a compound discovered by three Nobel price winning scientists in 1998. It improves skin texture, elasticity, thickness, stimulating cell regeneration, and restores moisture. It Reduces Wrinkles and Creates Tighter, Smoother Skin. Cinderella Skin Tight Instant skin firming face lift. Don't wait months to see results. You will see instant skin firming results all over your facial skin in just minutes. Gives instant BOTOX®-like effects, safely, quickly and without the expense and pain of injections. 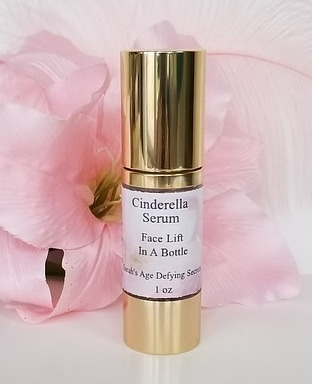 Instant "Face lift" Serum - Face Lift in a bottle removes wrinkles fast...very fast! Our Instant Wrinkle Serum is a multi-tasking formula skin firming for the neck, chest and décolleté that visibly smooths crepey, fragile skin and corrects and prevents uneven skin tone and sun damage. It looks medical because it is medical grade skin care. You can use this product as needed. The long term benefits are wonderful for the skin on the face while providing quick, fast skin tightening for a night (or day) on the town or work. Just imagine having this little bottle of magic for use at your convenience. You can have an instant face lift without the need for any surgery or uncomfortable needles. Imagine being out all day and then meeting friends for dinner or a coffee. All you have to do is apply the serum where you need it before leaving the house and then pop the 1 fl oz bottle into your bag. Whenever you feel the need to lift up your face, just take the bottle out of your bag. You can then enjoy the occasion, knowing that you look GREAT and your skin is getting healthier as the time goes on. IT'S EASY, ITS FUN, AND THE RESULTS ARE ASTONISHING! Apply to clean skin when desired. Apply with tips of fingers in direction that best smooths wrinkles. This is a wonderful product; my skin is so soft and younger looking! A fabulous product! Love this. Really does what it says. Works great and makes your skin feel great. It has also replaced my primer. My skin feels another after just a short time off using this. I'm sold! Talk about instant results you can not only feel the tighting but see it. I looked amazing for my class reunion this product took away the fine lines around the eye area for me making me feel better and confident. I love Cinderella Skin-Tight Serum so much. I am 72 years old and I have never seen such astonishing results. Now I can't live without it. I have to say I have used many creams and serums in my life and this is the BEST serum that I have ever used. I do my research before I buy and the active ingredient in this product is called "Pepha Tight" and let me just say it does what it claims to do...tighten the skin. This works instantly by reducing my wrinkles and fine lines. It is great to put on right before a business meeting, a night out or use it daily like I do. I like to refer to the Skin Tight as my "Instant Gratification Serum" it makes me look and feel younger. It was almost to good to be true to get such a high quality product at such a low price. I hope this helps anyone who is wondering " does it really work" YES IT REALLY WORKS!!! This serum is the one! This is a must have product for ladies my age. Apply it before a night out on the town and look and feel ten years younger. You get instant results that last for hours. I have recommended this to all of my girlfriends. Recieved as gift, the results are REMARKABLE!!!!! Never going back to Oil Of Olay again!!! This is an excellent product and definitely recommend the best antiwrinkle cream I have ever used. I am in love with this serum and hope never to be out of it!!!!! !